The Cottonwood forest is a prominent feature of our local landscape and has always been an important part of local life along the Rio Grande. Ancestral Puebloans living in this area for thousands of years had many uses for Cottonwood trees. Artisans crafted drums from their hollowed out trunks and carved kachinas from their soft roots. In spring catkins were collected for food and leaves were chewed for toothaches or used as a poultice for skin abrasions. The wood of the Cottonwood tree was a favorite for firing pots and the bark, which peels off in large thick strips, was used for splints. The fluff from Cottonwood seeds was even mixed with the white sap from Milkweeds and used as chewing gum. As Spanish settlers began moving up the Rio Grande Valley, they too found comfort in the Cottonwood forests where they began transforming it into farmland and creating a system of diversion channels called acequias. They also came to integrate Cottonwoods and other companion plants into their plant medicine traditions. 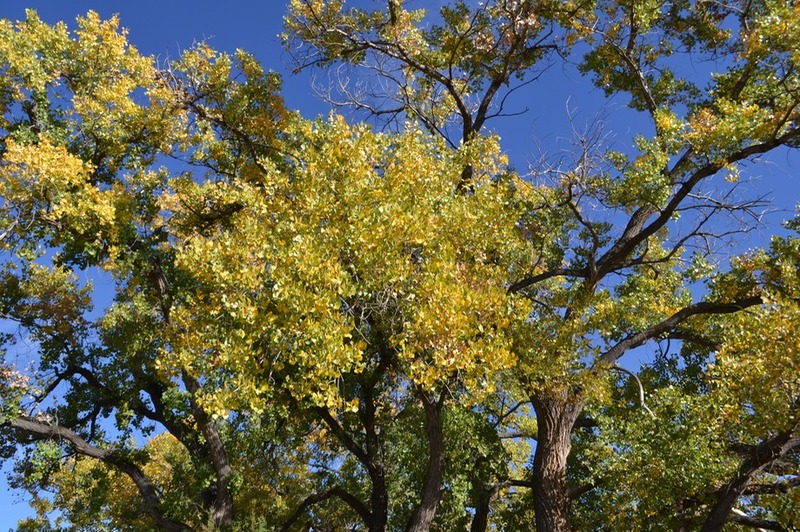 The bark of Cottonwoods was prepared as a tea to treat fevers, arthritis, and diarrhea. An astringing poultice for abscesses was also made by mixing the ashes of burned bark with cornmeal and water. An infusion of dried leaves was also prepared as a diuretic. Even today, the Cottonwood Bosque is beloved by locals, mostly as a treasured recreational area for dog walking and bird watching, but also a source of inspiration from wilderness in an increasingly urbanized world. Walking amongst the Cottonwoods in late winter, I am drawn into a sensory world of sights, sounds, smells, and other sensations reverberating from prehistoric times. The mountain vistas and endless blue skies, the song of the sandhill cranes heading off to the Platte River, and the powerful scent of Yerba Mansa underfoot have all been a part of this place for millions of years and connect me to the ancientness of this landscape. The wise old Cottonwood trees have been a part of this phenomenon for at least 2 million years as indicated by the fossil record. Added to this rich sensory experience is the harvesting of Cottonwood buds, which produce sticky resin in February and March. One of my favorite herbal medicines comes from these beautiful Bosque buds. The next time you come across a Cottonwood tree in late winter, pinch the buds and see how sticky they feel. After pinching a few of these your fingertips should have a thin coating of sticky dark resin. This means you’ve got good medicine in the making. Now collect a jar full of these, remembering that each bud is the potential to grow a leaf. Please be kind to the trees and don’t take too many from one place. Cottonwood trees frequently break branches in windstorms and you can often find fresh branches on the ground that may be covered in buds. These are the best because the have no consequence to a living tree. Next cover these buds in olive oil or coconut oil and steep for a week or longer. A wood stove would be ideal for this, but since I do not have one, I do it in a crock-pot. With the buds covered in oil in a canning jar, fill the crock-pot with water, set it to low heat, and place the glass jar in here for a warm water bath. You will need to keep adding water and stir the oil each day. After this process is done, strain the oil through a cloth-lined sieve. You now have a lovely resin-rich massage oil for the treatment of bodily aches and pains of the musculo-skeletal system. This oil is excellent for overworked muscles, sore joints, or in case you want to pretend you are a tree. Clifford S. Crawford, Lisa M. Ellis, Manuel C. Mulles Jr., “The Middle Rio Grande Bosque: An Endangered Ecosystem,” New Mexico Journal of Science 36 (1996): 276-299. Jean-Luc Cartron, David Lightfoot, Jane Mygat, Sandra Brantley, and Timothy Lowrey. A Field Guide to the Plants and Animals of the Rio Grande Bosque (Albuquerque NM: University of New Mexico Press, 2008). Michael Moore, Los Remedios, (Santa Fe NM: Museum of New Mexico Press, 1990). This entry was posted in Bosque, herbal medicine, herbalism, herbs, native plants and tagged Bosque, Cottonwood, Cottonwood bud oil, desert, herbal medicine, herbal products, herbal remedies, Populus deltoides, Rio Grande, Rio Grande Cottonwood on March 27, 2015 by darasaville.